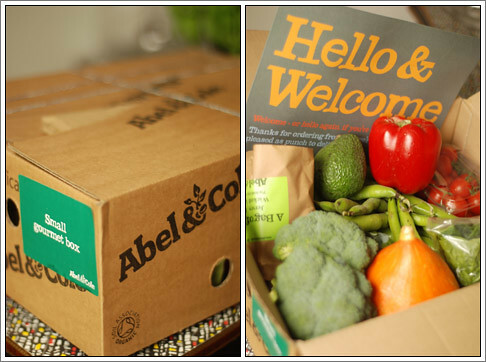 Slightly (very) late to the party I know, but I finally signed up for an Abel and Cole veg box. I had recently been over at a friend's and she has been getting one for a while. I've always been slightly envious of it, so, coupled with an inspiration drought on the blog front, I figured it was well and truly time. She recommended I get the gourmet box as you occasionally get some of the more interesting vegetables. Following some eager peering out the window before I left for work, I got on my bike, accepting that I was going to have to wait until evening. There were several showers throughout the day, so I fretted a little about what I was going to come home to. I needn't have worried - tucked out of the sight of opportunistic strangers and sheltered under a bush in my front garden was a little string-wrapped cardboard package waiting for me when I got home. First impressions were great - it was mostly dry, and it was definitely not in the hands of anyone else. I quickly opened it to see what was inside (which admittedly, I already knew as they tell you on the website) and feasted my eyes first and foremost on the glut of broad beans in front of me. I love broad beans more than anything. In all honesty though, I was impressed as it was a nice, seasonal and eminently useable selection. There is nothing I won't use, and I'm looking forward to thinking what to do with the beautiful squash. So let's hope this is the inspiration I need, to keep blogging and keep trying out and making new and interesting recipes.